Reserve your spot with a $14 per person donation to the QCC Fund, Inc./KHC Endowment. 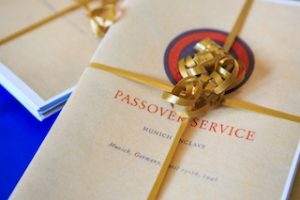 A copy of the 1946 Haggadah and a kosher meal will be provided to each guest. The program will be led by Rabbi Charles Agin with cantor. You must pre-register to attend. Online registration is encouraged. No one will be admitted without a reservation. No tickets will be sold at the door. Free tickets are available for Queensborough Community College Students – please email the Center at [email protected]for more information. Checks must be made out to “Kupferberg Holocaust Center/QCC Fund, Inc.” Please write “Seder 2019” in the memo line. Doors will open at 11:45am. Seating is limited to 250.